I had to start you off with that quote so you would feel better about this post. This is real indulgence. My husband and kids love these ice cream sandwiches. 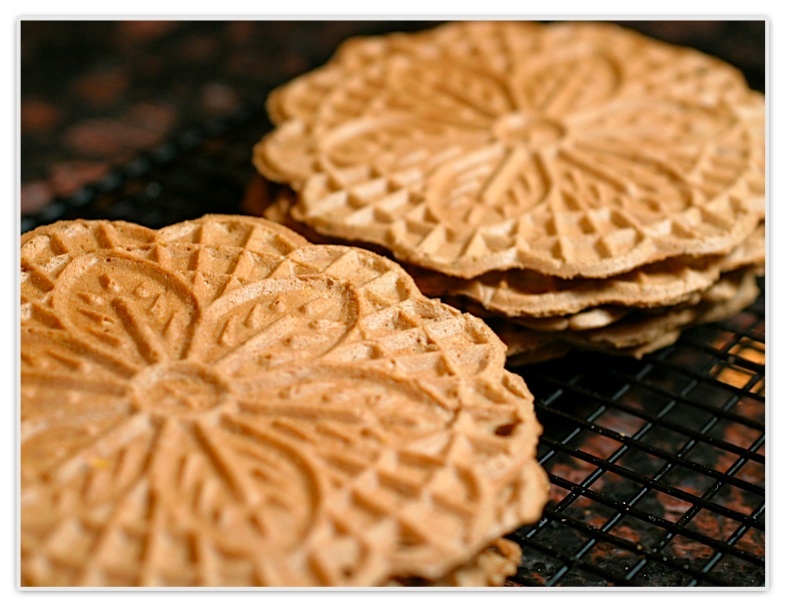 You can make these with store bought italian pizzelle cookies, but it's so fun to actually make the cookies yourself. 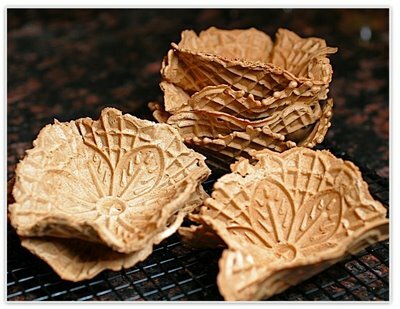 Pizzelle cookies can be made in any flavor and shaped when still warm, allowing you to make little waffle dishes or cones. But my guys' favorite way to eat them is to smear them with their beloved Nutella, cut slices of ice cream and make a sandwich out of them. Of course, you can also just eat them alone, as a cookie, but what fun is that? Beat eggs and sugar. Add cooled melted butter and vanilla. Sift together the cocoa, flour and baking powder. Add to egg mixture. Batter will be stiff. 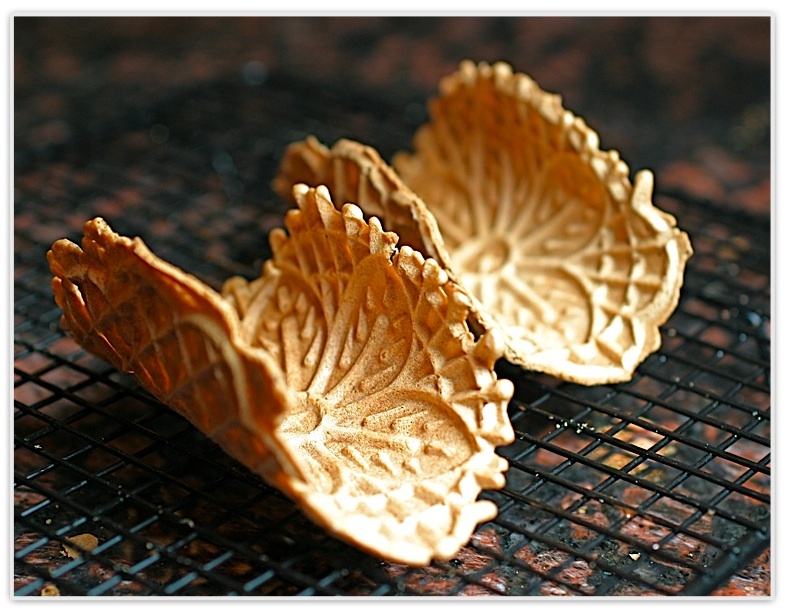 Drop by teaspoonful onto pizzelle maker. Close lid and cook for about 20 seconds. 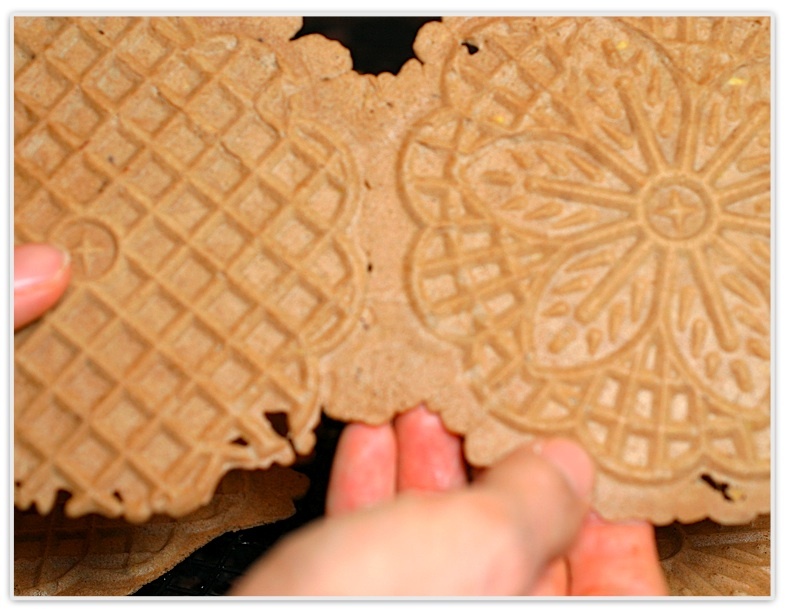 After the first couple, you will know how long to cook them for your pizzelle maker. Makes 30 pizzelles. The pizzelle maker I use is from Villaware. For all you Nutella lovers out there, you may enjoy this link. Note: For all the readers who subscribe to my blog through a Reader, I apologize for my feed going out twice. I have tried to work through Feedburner to figure out why this is happening, and cannot get it solved. Bear with me until it gets fixed! Thanks! Those ice cream sandwiches look delicious. And with nutella, what's not to love? This sounds so wonderful. I could even imagine some nice caramel sauce in there too. You've just reminded me that I received a pizzelle maker as a gift years ago - probably time that I tracked it down! You might be considered a bad influence! 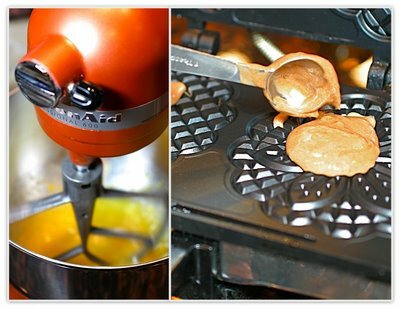 I have that same pizzelle maker, and I can get Nutella imported from Italy at The Chelsea Market. So I guess I know what my next decadent concoction will be. Thanks for the quote. It helps (a little). Yummy! My family will love this! That really looks delicious. ohhhh. i just love pizelles. these look beautiful. i just got an iron but haven't used it yet. i love the idea of bending them while they're warm. i'm definitely pulling my iron out soon! We used to make pizzelle ice cream sandwiches and cannoli shells when i was a kid. They were always a huge hit for b-day parties! This could possibly be my new favorite thing!! i normally stand on my chair so to get the dessert cart person's attention sooner! LOVE this recipe and especially love the wise addition of nutella ! 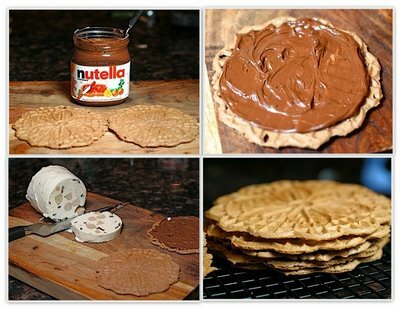 I got a pizzelle iron from a friend for Christmas and this sounds like the perfect recipe to try first! Bookmarked! A real indulgence indeed. These look so delicious! These look beautiful. My waffle maker came with pizelle plates, but I haven't tried them out yet. I love Pizelle's. I also use a VillaWare pizelle maker. I never thought about doing this with them. Thank you. 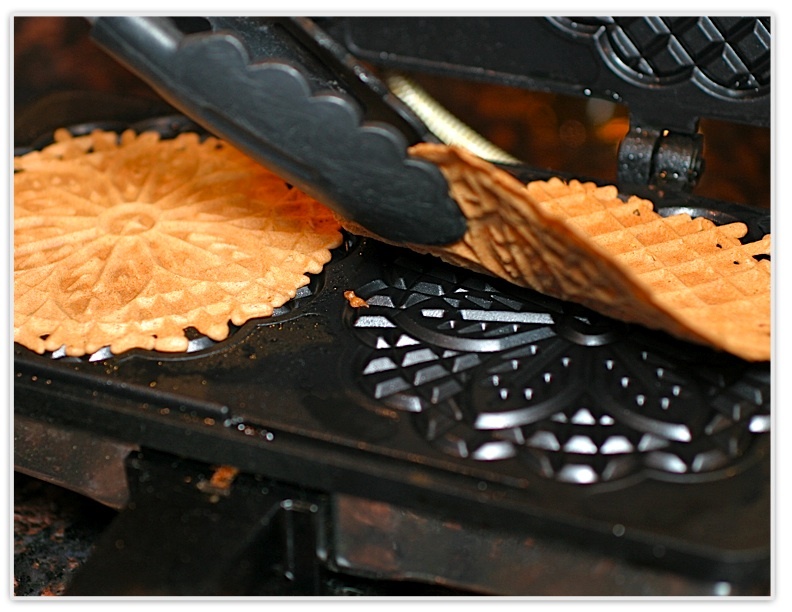 I've always been afraid to buy a pizzelle maker because I feared I'd gain too much weight since I love them so. Your ice cream sandwiches look delicious. Have you ever made a savory pizzelle? I just thought about that possibility, pizzelle crackers? Arlene: What a great idea. I've never made a savory pizzelle. That's really got me thinking of the possibilities. . . thanks for the idea! thank you for your kind words. then i come here and i see my favorite thing ever. ice cream sandwiches with nutella! oh man... can i have these for breakfast? How gorgeous.Oooooooooh...I wish I had a pizelle press too. Unheard of where I live. Those cups are beautiful! What a fun dessert! I had a pizzelle maker, but I'll be darned if I know what ever happened to it! 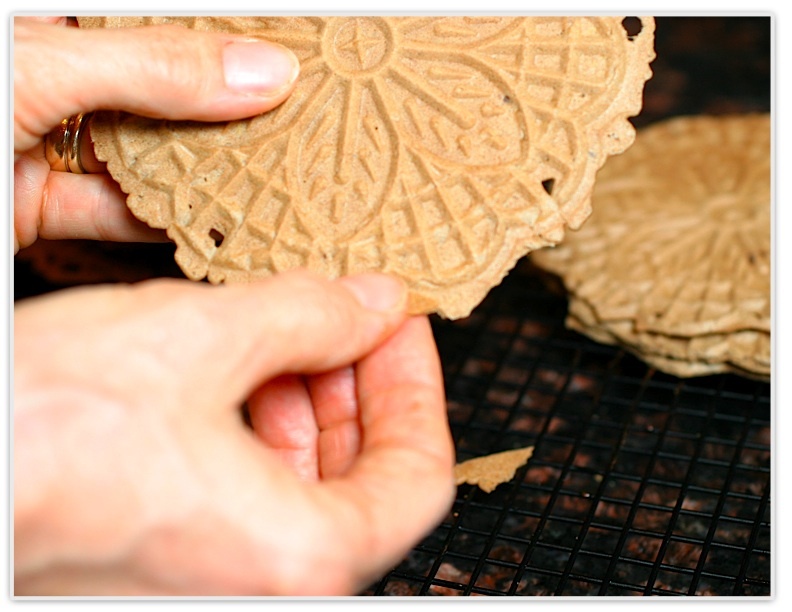 I do have though a single pizzelle maker with a long handle that you hold over the stove. It's back breaking work and takes *forever* to get a nice pile of cookies made! What a neat dessert. I'd love to have one of those pizzelle makers! So cute! Wow.. I made these the other day for friends and we all loved it!! Thanks for sharing! It's a keeper for sure! This really a 'cool' idea. Thanks for sharing. 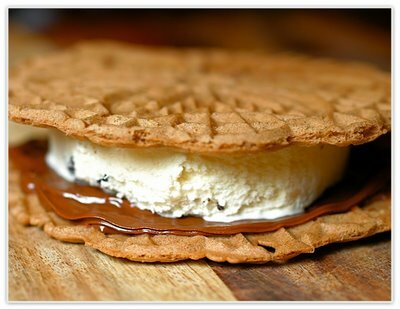 I'm going to make my own ice cream sandwiches pizzelle. Mmm, Yummy! Which is better...polished or non stick? I'm shopping for a pizzelle iron and I need help! Jackie: I have a nonstick one and I love it. What kind of ice cream is this? Looks yummy!!! Better? I want to love my new cookie maker! !